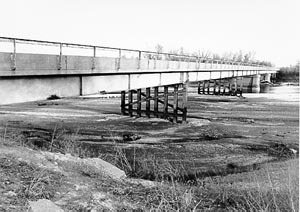 In late summer 1934, the Nebraska Bureau of Roads and Bridges completed the drawings for two multiple-span bridges over the South Platte River in Keith County. The Brule and Roscoe State Aid Bridges were each comprised of seven steel I-beam stringer spans, supported by concrete piers in the river's channel and steel pile bents in the floodplain. In September, the McClintic-Marshall Corporation of Chicago was hired to fabricate and build the two structures. The Roscoe Bridge consumed some 1,400 cubic yards of concrete, 81,000 pounds of reinforcing steel, 14,000 pounds of steel in the piers and 282,000 pounds of steel in the superstructure. Completed by the spring of 1935, it has carried traffic since, in essentially unaltered condition. The Roscoe Bridge was among the final projects undertaken using state aid. Soon after its erection, the state aid bridge fund was phased out, ceasing entirely in 1936. This structure is noteworthy as an important crossing of the Platte River, as a well-preserved example of long-span beam construction, and as one of the last state aid bridges built in Nebraska.